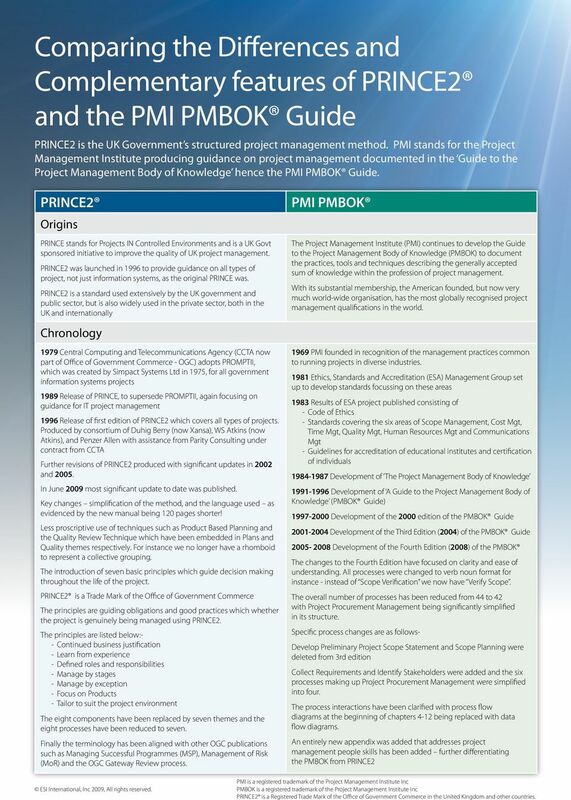 Download "Comparing the Differences and Complementary features of PRINCE2 and the PMI PMBOK Guide"
3 Structure Initiating a Project takes you through the detailed steps to firstly define the Management Strategies which will be required for Risk, Quality, Configuration Management and Communication. This leads into setting up appropriate controls, developing the Project Plan, updating the Business Case before assembling all the information in a Project Initiation Document (PID) and preparing for the next stage Directing a Project covers the key decision making steps made by the Project Board who act as the Sponsor / Steering Committee for a PRINCE2 project Controlling a Stage covers the day to day management of a project by the Project Manager including authorising work, handling issues, monitoring and controlling the project, as well as communicating progress. Managing Product Delivery covers the detailed planning, delegation, monitoring and control of work packages and reporting of progress Managing a Stage Boundary covers the activities to prepare for the next stage of the project as well as handling Exception planning. Closing a Project provides guidance on ensuring the project comes to an orderly close along with capturing and sharing lessons, preparing the Benefits Review Plan to evaluate benefits and passing on any follow on actions appropriately. Tailoring PRINCE2 to the project environment takes all the guidance that was spread out in the previous manual and consolidates it into a single chapter. It gives guidance both in how best an organisation can embed PRINCE2 throughout the organisation along with how to tailor PRINCE2 to the needs of an individual project. The five appendices are as follows A. 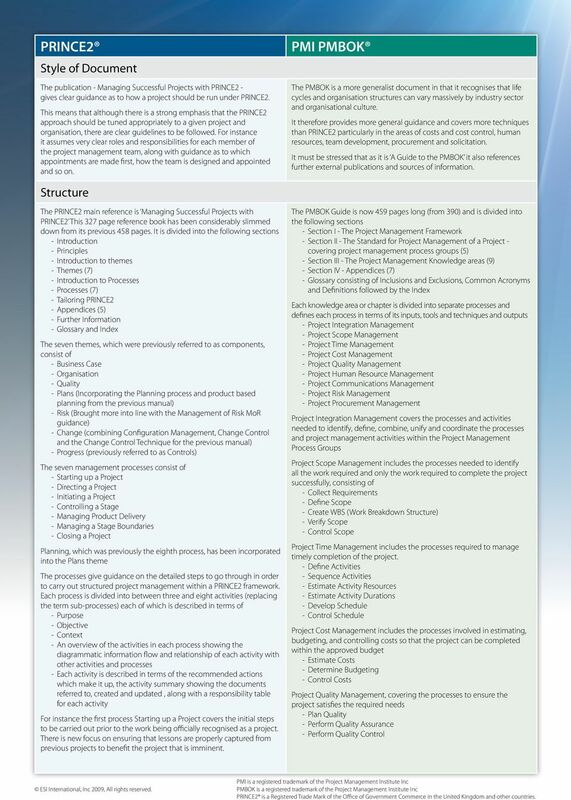 Product Description 0utlines providing outlines for 26 standard management documents used within PRINCE2 from Benefits Review Plan to Work Package B. Governance compares how well PRINCE2 addresses corporate governance requirements of project management C. Roles and Responsibilities providing detailed role descriptions and decision making and assurance responsibilities for each of the individual and group roles within PRINCE2 D. Product-based planning example previously the manual had a chapter entitled Product Based Planning Technique where product is used as an alternative term for deliverable. The technique is now part of the Plans theme and we have an example of applying the technique in a project scenario E. Health check provides a series of process-oriented checklists to assess how well PRINCE2 is being applied to your project Project Human Resource Management includes the processes that organise, manage, and lead the project team - Develop Human Resource Plan - Acquire Project Team - Develop Project Team - Manage Project Team Project Communications Management covers the processes required to ensure timely and appropriate generation, collection, distribution, storage, retrieval, and ultimate disposition of project information - Identify Stakeholders - Plan Communications - Distribute Information - Manage Stakeholder Expectations - Report Performance Project Risk Management is focused on increasing the probability and impact of positive events, and decreasing the probability and impact of events adverse to the project and consists of - Plan Risk Management - Identify Risks - Perform Qualitative Risk Analysis - Perform Quantitative Risk Analysis - Plan Risk Responses - Monitor and Control Risks Project Procurement Management covering the processes to purchase or acquire the products, services, or results needed from outside the project team to perform the project - Plan Procurements - Conduct Procurements - Administer - Close Procurements The six appendices A. Fourth Edition Changes B. Evolution of PMI s A Guide to the Project Management Body of Knowledge C. Contributors and Reviewers of PMBOK Guide - Fourth Edition D. Application Area Extensions E. Additional Sources of Information on Project Management F. Summary of Project Management Knowledge Areas G. Interpersonal Skills PMBOK areas supporting the PRINCE2 approach There are several key project management areas that are not covered by the PRINCE2 approach. Generally this is covered by the PRINCE2 view that, despite the importance of these topics, they are specialist areas of knowledge and are covered elsewhere and can be managed using the method as an overall framework. However, for a project manager to be confident and competent in carrying out their work, then ESI can assist them in developing these competencies. 1. PRINCE2 Planning process has a structured approach which takes you through sound planning steps, however, when identifying dependencies it proposes a list of activities accompanied by dependencies is produced. In the PMBOK far greater guidance is given on the use of Precedence Diagramming Method (PDM), Arrow diagramming Method (ADM), Conditional diagramming methods and Network templates in order to generate an effective network diagram. A network diagram is illustrated within PRINCE2, however, carrying out the calculations are not part of any current or proposed PRINCE2 examination. 2. In the previous version of PRINCE2, estimating techniques were not covered other than referring to top-down and bottom-up estimating done for Project and Stage plans respectively. This has been largely addressed in the revised Plans theme where more estimating techniques are outlined, with a single paragraph explanation of each given technique. The tools within the PMBoK Project Time Management and Project Cost Management sections are still more comprehensive than in the PRINCE2 manual, including such techniques as Programme Analysis and Review Technique (PERT) and Reserve Analysis and Cost of Quality (COQ) analysis along with indicating confidence ranges of possible results, would all be useful additional techniques. 3. Scheduling within PRINCE2 does not give guidance of how to improve the schedule if overall timescales are unacceptable. The PMBOK techniques of fast-tracking and crashing projects focus on how to improve project timescales in a cost effective manner. 4 PMBOK areas supporting the PRINCE2 approach 4. Costing and cost control are handled lightly within PRINCE2. The main technique being the plotting of a cumulative cost curve (S-curve) with tolerance margins illustrated, and recording the actual costs of the project with a second line. The powerful performance measurement techniques such as Earned value management, as given in the PMBOK are missing from PRINCE2. In fact this is a prime selling point for PMI training as PRINCE2 relies heavily on the concepts of management by exception and use of tolerances, but without the use of Earned value management you cannot readily determine the progress of your project and how healthily it is performing. 5. 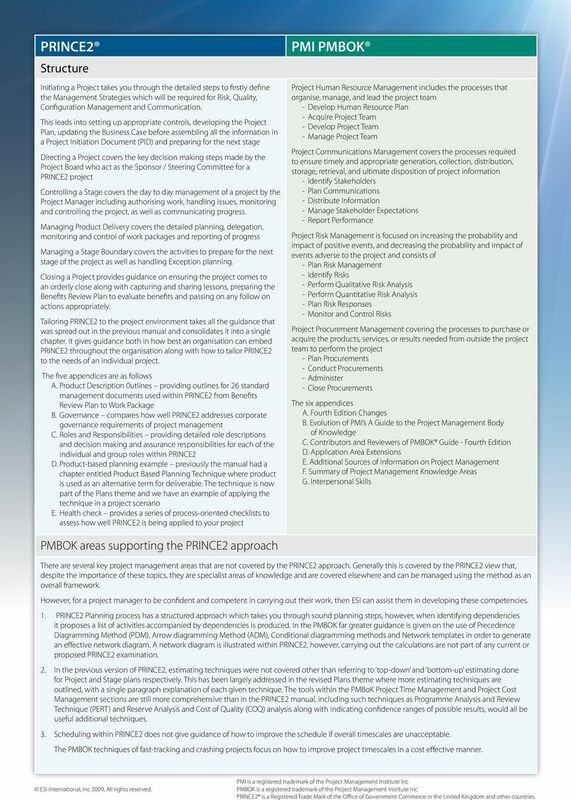 The generation of cost estimates is extensively supported in the PMBOK guide, giving great support to project managers with financial responsibilities, with techniques such as vendor bid analysis and use of cost management plans. All the above points are supported by ESI s Scheduling and Cost Control - the majority (1-4) are covered by Managing Projects and Managing IT Projects 6. Quality is a major topic within each of the approaches. Key PMBOK techniques which are not covered in PRINCE2 include benefit/cost analysis, benchmarking, flowcharting techniques such as Ishikawa or cause-and-effect diagrams, design of experiments, and cost of quality. The specific area of quality control is again supported by additional techniques such as control charts, Pareto diagrams, sampling and trend analysis The above is supported by ESI s Quality for Project Managers 7. PRINCE2 agrees that Team work and communications are important facets of the Project Manager role but gives no guidance other than suitable document outlines to use when communicating progress or escalating concerns The ESI Project Leadership, Management and Communications course covers such areas as setting direction, aligning people, motivating and inspiring, leading teams, communicating, building relationships, facilitating ethical conduct, negotiating, and leading change, ensuring project managers are rounded out with the second half of their required skill-set. 8. Project Human Resource Management within PMBOK also covers staff acquisition, performance appraisal and health and safety regulations, none of which is mentioned in PRINCE2. 9. PRINCE2 covers communications primarily through the development of a Communications Management Strategy outlining the overall approach to engaging stakeholders. However, it goes little further than listing headings in the Communication Management Strategy product outline and providing a six step approach to stakeholder engagement derived from OGC s Managing Successful Programmes (MSP) guidance. The PMBOK explores use of differing technologies, communication skills, retrieval systems and distribution methods, providing the project manager with additional tools. The ESI Project Leadership, Management and Communications course covers point 9 and partially covers point 8 above 10. Risk is again a topic which both approaches explore in some detail. The main additional elements in the PMBOK approach cover the advantages and disadvantages of linear and nonlinear numeric probability and impact scales, project assumptions testing, data precision ranking and quantitative risk analysis techniques. Techniques such as Monte Carlo and decision tree analysis (referred to as probability trees in PRINCE2) are briefly described in the PRINCE2 manual; however, it lacks the technical detail provided in the PMBOK which enables a more analytical approach to be taken. ESI s Risk Management covers the above point 11. Perhaps the largest single section of project management which is not covered in the PRINCE2 approach is Project Procurement Management. 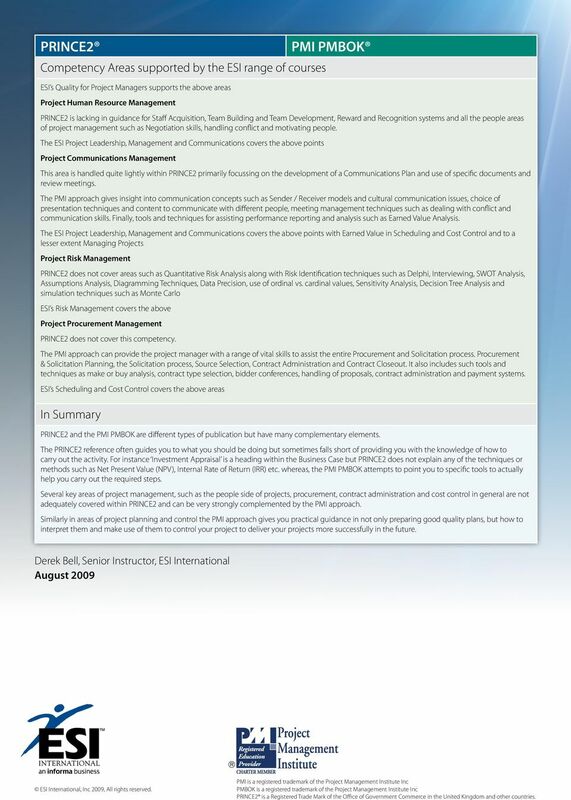 ESI s Contracting for Project Managers course is aligned with this PMBOK chapter and equips the project manager with the skills and knowledge to handle procurement and solicitation namely determining what to procure and when along with handling the entire contract process from planning, obtaining quotations/proposals, selection, contract administration and completion and settlement of the contract. ESI s Managing Projects event assists several of the points above particularly in the areas of planning and costing, but not to the same degree of detail as the Scheduling and Cost Control event ESI s Project Management Applications covers many of the above items in a rigorous week long case study Competency Areas supported by the ESI range of courses The first two competency areas of Project Integration Management and Project Scope Management are adequately covered by the PRINCE2 approach Project Time Management PRINCE2 does not cover mathematical analysis techniques such as CPM and PERT analysis duration compression techniques such as crashing and fast tracking to improve the project schedule. Similarly performance measuring techniques such as Earned Value and Variance Analysis are not covered ESI s Scheduling and Cost Control and to a lesser extent Managing Projects and Project Management Applications support the above. Project Cost Management The PMI model provides far greater guidance on cost estimating, including use of cost accounts, different estimating techniques, budgeting and cost control techniques such as Earned Value Management ESI s Scheduling and Cost Control and to a lesser extent Managing Projects and Project Management Applications support the above. Project Quality Management The PMI model covers significant additional techniques such as Benefit/Cost Analysis, Benchmarking, Flowcharting, Cost of Quality concepts, Operational Definitions. It also covers technical quality control techniques such as Inspection, Control Charts, Pareto diagrams, Statistical Sampling concepts and Trend Analysis.